Join our mailing list for new and updated information. Welcome to Bella Vista Bed & Breakfast! 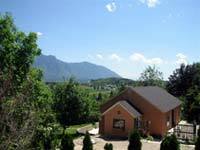 Located in the beautiful Creston Valley in the south east corner of British Columbia, Bella Vista Bed & Breakfast offers a unique experience for the travelling business person or couple looking for a taste of luxury in the country. Surrounded by breathtaking mountains and a lush vibrant landscape, guests will enjoy all the benefits of a quiet retreat combined with exceptional services and all the modern conveniences. Enjoy your stay. It's the luxury you deserve. Nestled within a 6 acre cherry orchard and surrounded by stunning mountain views, Goat River Bed and Breakfast offers a taste of simple country living. You’ll find plenty of ways to enjoy our down-home atmosphere, good old-fashioned hospitality and beautiful surroundings. This is a place where friends are made. Kristina Creek B & B is set in 156 acres of tranquility giving the visitor a wonderful opportunity to observe wildlife and birds in their natural setting. Where Beauty and Relaxation Meet! 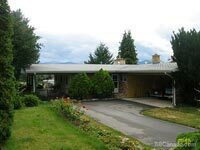 The Peachwood Guest House & Art Studio has a gorgeous view of the Creston Valley with a quaint self-contained home. Two bedrooms, one full bathroom, Living room, and full-equipped kitchen. Beautiful surroundings both inside with artwork galore, and outside on the private balconies. Extended stay reservations welcome. Smoke free/pet free environment. 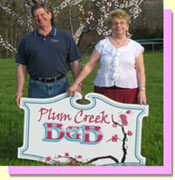 Come stay with us at PLUM CREEK and "MAKE YOURSELF AT HOME AT OUR HOME". Conveniently located on the east side of Creston on Highway 3, we offer wireless internet, a kitchenette, t.v. room, continental (or cooked) breakfast and panoramic mountain views with a private entrance. We are a leisurely stroll from downtown Creston. Two rooms are available for your visit with us. See you soon! A short drive to a total escape! Century-old Wedgwood Manor graces a 50-acre estate of amazing beauty. The lovely English country house, filled with antiques and art, offers six welcoming rooms, each with ensuite bath. Sit by the brook, stroll the gardens, or relax by the fire with a book.